Treat yourself and your BFFs to a little relaxation and rejuvenation this holiday season with Everything She Wants' fragrant bath and body holiday gift picks. 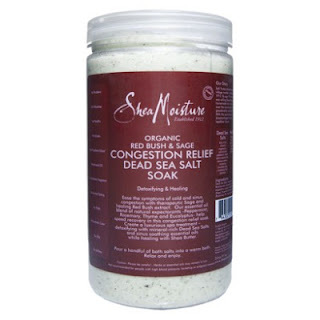 SheaMoisture Red Bush & Sage Congestion Relief Bath Soak ($10.99, Target): Relieve sinus pain and congestion with an essential oil blend of natural peppermint, rosemary, thyme and eucalyptus. Rich in alpha hydroxyl acid and zinc, the Red Bush helps heal skin, while the Sage brings anti-bacterial and calming properties to balance skin functions. JĀSÖN® Antioxidant Cranberry Body Wash ($14, natural food stores): Usually, feeling like a turkey isn't a good thing. But this gentle, delicious smelling wash conjures savory and sweet Thanksgiving Day flavors. The natural blend is infused with Cranberry Oil and soothing Aloe Vera to fight oxidative stress, and Vitamin E and Pro-Vitamin B5 to soften the skin. Forever Red by Bath & Body Works ($12.50 - $22.50, Bath & Body Works): A blend of luxurious, rare, carefully curated notes including Brazilian pomegranate, fiery marigold and a rare French red peach, Forever Red introduces a new era of fragrance to Bath & Body Works. From the ingredients to the package design, every aspect of this fragrance brand is impeccably chic, just like the woman meant to wear it. Nourish Fresh Fig Organic Body Lotion ($9.99, Whole Foods Market): This smooth and soothing lotion made with organic aloe, rice protein, acai berry and essential oils, and Vitamin E, has a subtly enchanting scent of fresh fig and apricot. It's a must-have for the holiday season. 365 Everyday Value Foaming Hand Soap in Ginger Spice or Peppermint Vanilla ($4.99, Whole Foods Market): You’ll look forward to washing your hands with these festive hand soaps scented with pure essential oils.